but, can I let myself love him? Will she come back to me? Something about lethal, predatory, shifter Luke calls out me. He’s my fated mate. It tears me apart, but I must walk away from him to find my blood family. What I hadn’t counted on was uncovering secrets about my past. Revelations that change my life forever. I now face the ultimate test to become Alpha. If I lose, the future of my pack is at stake. Can I overcome the challenge, while winning back the only man I want to be with? A standalone paranormal romance sizzling with love, lust, betrayal and shifters. This is book 1 of 2 in the main Many Lives Series. This duet is complete with Feral and Taken. Grab yours today for only 99¢ (or free in KU)! It’s not often that Alpha challenges take place. And this—where I fight a fellow pack mate for the right to be Alpha—is unusual. It’s never happened before in the history of our pack. Then all thoughts go out of my head as Gabriel beats his chest. Head thrown back, he howls out a challenge. It echoes around the courtyard and then further out into the forest. Then a howl from beyond the complex, then another. It’s the feral shifters. I don’t react, don’t even move a muscle. Don’t breathe. Closing my eyes, I focus inwards, reaching out through the bond for Luke. Zoom in on that gleaming silver-gray and amber strand that connects us. Wait! Luke’s voice rings through my head. Clear as a bell. I lock onto Gabriel’s gaze. And wait. The buzz of disquiet from the pack members in the balconies above. The trees bowing their branches, rustling their leaves. The stray roar of a wild tiger in the forest. The faraway hum of vehicles on the road leading to the city…All of it fades. Leaving me in a bubble of silence. I watch Gabriel tense. His muscles twitch with impatience. The sweat glistens on his face. Then, just as I begin to lose patience, reach the end of my vigil, he gives in. With a roar of impatience, he rushes toward me. I still wait, Luke’s strength grounding me, holding me when I would’ve leapt to meet him. In place until the last minute. Then, Go! A pulse rippling down the mating bond pushes me to step aside at the last second. Gabriel’s body barrels past. So close the breeze in his wake ruffles my clothes. He crashes face down, and before he can recover, I’ve leaped on his back with enough force to hear the satisfying crunch of snapping bone. A howl from him, and then I raise my hands, fingers clasped, aiming for his forehead. But I underestimate his speed. Gabriel’s a shifter, and his body blurs as he moves. He throws me off with such force that I fly through the air, landing halfway down the courtyard on my back. The breath knocked out of me, my head crashing against the hard ground. Before he can jump on me, I’m up. On my feet and moving aside as he rushes me. And misses. This time, he turns fast, his movements almost too agile for his big body. And I don’t have a choice but to meet him face-to-face. Head-on, I don’t stand a chance. He’s bigger, more powerful. He’ll kill me. 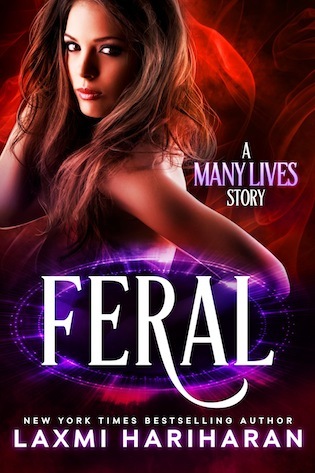 In a world full of shifters, vampires and immortals, the Many Lives Series is a fast paced paranormal romance series. Packed with sizzling romance and action scenes that will take your breath away, this series traces the love stories of one woman's illegitimate descendants; all united by the power of her infamous sword.